Controlled deer hunts offered at State Nature Preserves, Buckeye Lake Beacon, Aug 2, 2018In a continuing effort to control deer populations, specifically those affecting native plant communities, the Ohio Department of Natural Resources (ODNR) will coordinate special deer hunts at nine state nature preserves across the state. Ohio’s nature preserve system protects some of the state’s rarest and highest quality ecology. Deer continue to exert a negative impact on many sensitive habitats at several state nature preserves. The primary impact is from the browsing of native vegetation by deer. Additional impacts can be seen as the rapid spread of various non-native invasive plants displaces many native Ohio plant species. Lyme Disease, Ohio Dept of Health, July 2, 2018yme disease cases are increasing in Ohio as the range of blacklegged tick populations continues to expand in the state and encounters with this tick occur more frequently, particularly in the forest habitats preferred by this tick. Most humans are infected through the bites of immature ticks calls nymphs. Nymphs are tiny (less than 2 mm) and difficult to see; they feed during the spring and summer months. Adult ticks can also transmit Lyme disease bacteria, but they are much larger and are more likely to be discovered and removed before they have had time to transmit the bacteria. Adult blacklegged ticks are most active during the cooler months of the year. Are Deer A Problem In Shaker Heights? City Wants To Know, Patch, June 5, 2018For the past two years, the city has been using a deer reduction program. Basically, trained marksmen with the Shaker Heights Police Department have been hired to shrink the deer population. The marksmen program was implemented first in the winter of 2016 and 2017 and continued through the winter of 2017 and 2018. The survey will ask questions about whether or not there is an abundant deer population in a resident’s neighborhood, and whether or not there has been a noticeable change in the number of deer versus last year. Venison from Metroparks deer cull donated, Swanton Enterprise, Feb 20, 2018Metroparks Toledo donated 11,284 pounds of ground venison from this season’s deer management program to three agencies who feed local people in need: Cherry Street Mission, Holy Trinity Catholic Parish in Assumption and Family House in Toledo. All donations were coordinated through Cherry Street. he meat is from the 2017-2018 deer management season, which has now concluded for the season. Under the plan, the Ohio Division of Wildlife authorized Metroparks to remove up to 285 deer from seven parks. Silver Lake’s first deer culling program nets four deer, Akron Beacon Journal, Feb 9, 2018“I’m disappointed that we didn’t get more than four deer because I still think the deer are a threat to the safety and health of the community,” Mayor Bernie Hovey said at this week’s council meeting, according to the website. Sharpshooters’ deer culling to resume in Mt. Lebanon, TribLive, Feb 1, 2018After years of debate over the safety and necessity of a program, Mt. Lebanon has used a mix of archers and sharpshooters to cull deer since 2015, with the intent of reducing the number of deer-related car crashes. Woman killed in Fairfield Co. crash after striking deer, NBC4i.com, Jan 30, 2018A woman was killed in a Fairfield County when she pulled off the roadway after striking a deer. Ticks in Ohio, Ohio DNR, 2018Blacklegged ticks are active throughout the year in Ohio. The adults are active in the spring, fall and winter. The nymphs are active in the spring and summer and the larvae are active late summer. The onset of human Lyme disease cases occurs year round in Ohio but peaks in summer following the emergence of nymphs. Chronic wasting disease found in Guernsey County deer, Newark Advocate, Jan 17, 2018Ohio’s second confirmed case of chronic wasting disease was discovered recently at a hunting preserve in Guernsey County. Ohio confirms 1 case of disease fatal to deer, Fox8 Cleveland, Jan 14, 2018The Ohio Department of Agriculture says it has confirmed a positive case of chronic wasting disease in a captive deer and is taking steps to control any spread of the disease. Metroparks receives approval to kill up to 285 deer, Toledo Blade, Nov 28, 2017Mr. Schetter said the kill is needed to reduce ecological damage tied to an overabundance of deer in protected areas of the park district. Mr. Schetter pointed out that the permit requests to remove deer at Oak Openings is substantially less for this winter than what it was in the first two years, reflecting the success of the Metropark’s efforts to effectively control the deer population in those areas. “We have noted a marked decline in deer-related damage to rare plant populations and the formal research plots that we monitor throughout the years,” he said. Devastating disease killing deer in droves throughout Middleburg, Berea, Cleveland.com, Oct 5, 2017Epizootic (i.e. within its own species) hemorrhagic disease is as horrible as it sounds. A small midge bites the deer. Within five to 10 days, a high fever begins along with disorientation, lethargy and swelling of the head, neck, eyelids and tongue. Internal hemorrhaging and respiratory distress then follow, killing the deer within two days. The last EHD outbreak in Ohio was in 2012. Bay Village Police Chief impressed by resident response to deer survey , Cleveland.com, Aug 31, 2017The survey went live Aug. 28 and will be finished on Sept. 24. While he expects the final numbers to change, Spaetzel said early results find 73 percent reported an increase in Bay Village’s deer population over the last five years. Also, 65 percent would like to see a decrease in the population. Deer kill is returning with double the limit, Toledo Blade, June 27, 2017Bow hunters will again take to tree stands in Ottawa Hills this fall, on the lookout for white-tailed deer. Their goal is to kill twice as many as they did last year in order to keep the village’s growing deer population in check. Deer problem persists but lessens in Avon Lake, The Chronical, June 16, 2017During a Wednesday meeting of Council’s Environmental Committee, Shondel listed nine instances in the past month where police officers or the animal control officer responded to calls about deer. There were a variety of calls from deer attacking and, in one case, injuring dogs, to deer or fawns getting stuck in window wells or impaled on fences. In some of the instances, police responded and in others the recently hired animal control officer responded. Altavista relaxes bow-hunting restrictions, The News and Advance, June 15, 2017Bow hunters in Altavista will now be able to hunt closer to buildings and on the ground during the upcoming hunting season. Town Council voted unanimously this week to adopt two changes to the town’s Urban Archery Ordinance, now more than 10 years old. The changes allow bow hunters to shoot deer within 100 feet of a building instead of the previously required 100 yards. Ottawa Hills ends deer hunt, Toledo Blade, Jan 23, 2017Ottawa Hills officials said bow hunters on Jan. 6 reached their 30-deer limit, ending for the season the effort to reduce a herd that some village residents complained damaged plant life and posed driving hazards. Voters approved the controversial measure in 2015, five years after they rejected a proposal to have sharpshooters kill the herd. Toledo council may change law to allow deer kill, Toledo Blade, Jan 18, 2017Toledo City Council reviewed legislation Tuesday that would allow the Metroparks of the Toledo Area to kill white-tailed deer in Swan Creek Preserve Metropark in South Toledo and Middlegrounds Metropark near downtown. A study found the deer population in Swan Creek Preserve Metropark is double the ideal capacity for the habitat. Deer culling starts in northeast Ohio, Mentor using sharpshooters, News5 Cleveland, Jan 11, 2017Mentor implemented the culling program 4 years ago and they are now testing technology that keeps deer out of the roads. They had 98 deer-related accidents in 2013 and just 42 last year. Deer Culling is Underway at the Cuyahoga Valley National Park, WSKU, Jan 9, 2017Park officials say deer overpopulation poses a safety risk to locals, and threatens plant life in the park. Federal sharpshooters will be active in the park through mid-March. Another deer cull planned at Oak Openings, Swanton Enterprise, Jan 9, 2017Metroparks plans to implement the program at Oak Openings, as well as Swan Creek Metropark, between Jan. 1 and March 31 to reduce deer populations using trained marksmen from the USDA. Metroparks commissioned law enforcement officers will also serve as marksmen. A total of 165 deer were removed from Oak Openings Metropark during a 2016 cull. Lyndhurst begins 2017 deer culling program, Cleveland.com, Jan 4, 2017The city is about to begin its 2017 deer culling season and will again use the trap-and-bolt method that caused some residents to protest in 2016. Mayor Patrick Ward said. “The size of our lots doesn’t allow for sharpshooting or bow hunting.” This year, the Ohio Division of Natural Resources has permitted Lyndhurst to kill 30 deer. In 2016, the city was permitted to kill as many as 25. Ward, who said he’s received a great deal of support from residents who see deer overpopulation as a problem, said the need to cull deer is perhaps greater than in 2016. Deer population prompts plan for Metroparks kills, Toledo Blade, Jan 2, 2017Metroparks of the Toledo Area plans to kill as many as 200 white-tailed deer in Oak Openings Preserve and Swan Creek Preserve metroparks over the next three months as part of its ongoing effort to reduce ecological damage tied to an overabundance of deer in those protected areas. Annual deer culling to resume in Cleveland Metroparks, Cleveland.com, Jan 2, 2017Cleveland Metroparks sharpshooters are expected to begin culling deer in 11 reservations by mid-January, with the program running to about mid March. Avon Lake renews agreement for deer cull; goal is 70 this year, The Chronicle, Nov 15, 2016The city will again enter into an agreement with the U.S. Department of Agriculture to hire sharpshooters to kill deer on public property. At-large Councilman John Shondel said the Service Department has picked up 54 dead deer along roads since the start of the year compared with 73 in 2015. North Olmsted expanding its deer culling program, Westlife, Dec 8, 2016City officials are expanding North Olmsted’s deer culling program by adding 11 sites, more than tripling the number of deer it is requesting taking and adding a shooter. Ottawa Hills deer hunt has smooth start, Toledo Blade, Nov 6, 2016Thirteen white-tailed deer were killed in Ottawa Hills through Friday since a controlled bow hunt aimed at reducing the village’s deer population began Sept. 24. Voters in 2015 approved the controversial measure, five years after they shot down a proposal to have sharpshooters cull the herd that some say poses driving hazards and damages plant life. Up to 30 deer can be harvested, and village manager Marc Thompson said he expects hunters will hit that number before bow season ends in February. Eastlake seeks solutions to deer problems, News-Herald, Oct 15, 2016One of the solutions that Eastlake is considering is to allow archery-only deer hunting within the city. Currently, there is in ordinance in place that prohibits hunting within city limits. But the Ordinance Committee is drafting legislation that would change that and allow hunting by permit only with a specific set of guidelines in the proposed ordinance to be followed. Seven Hills council passes deer ordinance, Cleveland.com, Oct 4, 2016At a special meeting Oct. 3, city council unanimously passed the ordinance allowing bow hunting of deer on at least 2.25 acres of contiguous properties. The vote came after comments from residents who are against the culling of the deer population and residents who supported the passage of the ordinance. Other residents urged council to pass the ordinance because of bacteria-spread illnesses to their pets and danger from aggressive deer in their yards. Science over sentiment, Toledo Blade, Sept10, 2016A deer herd allowed to grow unimpeded will eventually lead to physical issues within the group and a cascade of even more unappealing damage to the biodiversity of the parks. Science must prevail over sentiment here. Deer control survey results presented to Avon Lake city council; $123,289 in damages, Cleveland.com, Aug 23, 2016A total of 766 surveys were completed on-line with another 156 completed on paper. The grand total was 922 surveys which makes it about a 4% return rate based on a population of 23,000. Average damage was $326.16 per estimate. Actual reported individual damage was up to $3,500. Westerville looking for options to deal with deer population, Columbus Dispatch, July 3, 2016Central Ohio municipalities that permit deer hunting inside their limits include Gahanna, Granville, Groveport, Heath, Newark, New Albany and Pataskala. There are differences among programs statewide, but typically registered, vetted hunters are limited to restricted areas and must notify police before hunting. Gahanna’s bow-hunting program has more than halved yearly deer-vehicle crashes, from about 70 in 2006 to about 25 last year, said Terrie Snider, the city police department’s office manager. Westerville police have logged 80 total deer-vehicle crash reports in the past five years. Parma city council passes deer control ordinance, sets $150 permit fee, Clevelnd.com, June 20, 2016Council passed an ordinance June 20 to authorize a nuisance abatement initiative for both short-term and long-term control and reduction of the white-tailed deer population. The ordinance is designed to be in coordination with the Ohio Department of Natural Resources and the surrounding municipalities that will adopt a similar plan for nuisance abatement. The vote was unanimous. Motorcyclist injured after striking deer in Clark Co, WHIO, June 19, 2016State troopers said a motorcyclist was transported by CareFlight after hitting a deer on Selma Road in Clark County.State troopers said a motorcyclist was transported by CareFlight after hitting a deer on Selma Road in Clark County. Several Car-Deer Accident Reports on Monday, Kenton Today.com, June 9, 2016The Hardin County Sheriffs Office responded to three reports of Car-Deer accidents on Monday. Mentor-on-the-Lake woman reports deer attack, News Herald, June 7, 2016Frost called police twice about the doe, whose fawn has been living under brush in her back yard. She said she is afraid to go outdoors or to take out her three small dogs without supervision. She asked police to assist once. Other times, she has a neighbor stand by with a baseball bat. Parma council takes next steps in deer control legislation, Cleveland.com, May 3, 2016Residents will soon have the right to allow bow hunters on their property to cull the deer overpopulation in the city. The ordinances to create a nuisance abatement initiative to control of the deer population went on first reading May 2. Metroparks defend deer cull, Toledo City Papers, May 1, 2016The cull, which took place between January 6 and February 8, saw a total of 195 deer killed by sharpshooters at Wildwood and Oak Openings Preserve. It was the latest effort of a larger program designed to control the damage done to the natural areas caused by an overpopulation of white-tailed deer. Carpenter was quick to differentiate the Metroparks’ policies from the proposed actions of Ottawa Hills. “Some people have equated the two situations, but they are not the same. The issues in Ottawa Hills are safety and property damage. In the Metroparks it’s about biological carrying capacity and the sustainability of our natural areas,” he said. Committee OKs Avon Lake’s 10-year deer plan, Chronical Telegram, April 14, 2016Deer overpopulation plagues Avon Lake, and over the past year sharpshooters hired through the U.S. Department of Agriculture have had success in culling operations. Residents who have taken steps to obtained deer damage control permits through the Ohio Department of Natural Resources, as well as municipal deer damage control permits through the city, have also contributed to the reduction using archery equipment. The plan highlights how the city intends to continue using sharpshooters to cull on city-owned property, including Weiss Field, portions of the Kopf Reservation, Walker Road Park and the city landfill over the next 10 years. Sharpshooters kill 350 deer in Ohio national park’s first cull, NBC4i.com, April 8, 2016BRECKSVILLE, OH (AP) — Sharpshooters in a northeast Ohio national park have killed 350 white-tailed deer in what officials are calling a successful first deer cull. Officials said Thursday the deer reduction occurred on 16 nights from January 11 to March 7 in Cuyahoga Valley National Park. A 2013 estimate indicated that the 33,000-acre park near Brecksville had about 1,700 deer. Prior to the cull, there was about 40 deer per square mile. Officials say they hope to cut that number in half. The reduction plan calls for shooting an additional 350 deer annually for the next three winters and 175 deer in the fifth year. Shaker council OKs deer sharpshooting program for next winter on public lands, Cleveland.com, March 29, 2016Councilwoman Anne Williams, who chaired the city’s Deer Task Force, noted that the Ohio Department of Natural Resources, which will oversee the city’s program, recognizes neither “trap-and-release” nor birth control for deer, which are not considered to have good overall success rates. Williams added that Shaker is not alone in the country or in Cuyahoga County, where six communities passed bow-hunting initiatives “quite handily” on local ballots earlier this month. Pedestrian hit, killed after moving deer from road in Akron, Fox 8 Cleveland, March 28, 2016Police at the scene say the victim was driving an SUV when he hit a deer. He got out of his vehicle to move the deer and was getting back into his vehicle when another SUV hit and killed him. City’s deer management program result of years of discussion: Mayor Patrick Ward, Lyndhurst, Cleveland.com, March 27, 2016Our Deer Management Program was crafted after many years of discussion and careful study, many years of hearing resident concerns and watching a variety of impacts on persons, property and the environment. We do have stewardship over public lands that contain 7.5 miles of above-ground streams and the plantings that would or should surround them if we did not have such an over-population of deer. We recognize the importance of our place in our watershed and our role in its health. Having a balanced, sustainable, deer herd is extremely important to our environment. The current imbalance cannot be supported and threatens the bio-diversity of our community and all those around us. Deer have foraged the undergrowth in our wooded areas and have eaten away the plants that once flourished on the banks of our streams; those plants hold back erosion and provide shade for habitat of other species as well. Birds and insects – necessary for dispersing pollen and seeds – have lost habitat to foraging deer. Our environment is a puzzle and too many of one piece throws off the balance. 6 Cleveland suburbs supporting deer bow hunting, Cleveland.com, March 15, 2016The results are not binding; city councils in each municipality must ultimately decide on hunting as part of a regional approach to managing deer. Nearly every community in Cuyahoga County is debating how to handle deer. An east-side deer study found as many as 37 deer per square mile. A study found 241 deer in North Olmsted. The cities started working together in July to develop strategies to control deer population growth, after the Ohio Department of Natural Resources declined to take responsibility of managing deer. The agency instead said it would provide guidance and support instead. Issue of bow-hunting deer passed by voters in 6 Northeast Ohio communities, FoxNews, Cleveland, March 6, 2016Voters in several Northeast Ohio cities approved a controversial method of tackling the over-population of deer. The issue of bow-hunting deer was passed Tuesday in all six Cleveland suburbs that placed it on the ballot. “You have to be darn careful when you’re hitting that deer that it goes down or if that thing bolts out, it’s gonna bolt out in the street. If they want to get a sharpshooter, that they’re gonna ‘boom’ and drop that deer, I’m all for that because they do have to be culled,” Ronsky said. Metroparks kills 195 deer at Wildwood, Oak Openings, The Blade, Feb 17, 2016The controversial deer kill at two preserves in the Metroparks of the Toledo Area system has ended with 195 of the animals being removed by sharpshooters, park district officials said Tuesday. The deer, 145 does and 50 bucks, were killed between Jan. 6 and Feb. 8 inside Oak Openings Preserve in Swanton Township and Wildwood Preserve in Sylvania Township, said Scott Carpenter, a Metroparks spokesman. The month-long kill was part of the Metroparks’ deer-management program that began three years ago to control the white-tailed deer population on its properties and reduce damage a burgeoning herd does to the habitat. Metroparks deer cull provides venison to shelters, The Blade, Feb 16, 2016The monthlong cull was part of the metroparks’ deer-management program begun three years ago to control the white-tailed deer population on its properties and reduce the damage a burgeoning herd does to the habitat. Lyndhurst Deer Advocates protest at city hall, council meeting over culling method; mayor stands his ground, Cleveland.com, Feb 16, 2016The trap and bolt method unpopular to protesters involves luring a deer into a cage trap and keeping the animal in that trap until an animal control officer arrives and dispenses a bolt into its brain. The animal, by law, can remain in the cage for up to 12 hours. Lyndhurst deer culling causing controversy: 5 things to know, Cleveland.com, Feb 11, 2016Lyndhurst has killed six deer this month, the only city in Northeast Ohio to use the controversial trapping and bolting method. The city has permits to kill nine more deer with bolts, after which they can return to the state to be reviewed for five more. According to an aerial survey done in December 2014, there were 44 confirmed deer, putting the deer population at 9 deer per square mile. Hunting is legal on parcels over 10 acres, but the city can’t rely on hunting to thin troublesome deer herds. The city wants to reduce deer vehicle accidents, property damage and deer aggression. Deer kill concerns voiced at metroparks meeting, The Blade, Jan 28, 2016The contract with Animal and Plant Health Inspection Service (APHIS), an agency of the U.S. Department of Agriculture, allows for marksmen to remove up to 200 deer from the two metroparks between Jan. 1 and March 31. The metroparks’ deer management program also includes allowing bowhunters to remove deer from remote areas of the Oak Openings Corridor, which runs from Secor Metropark to the Oak Openings park. Deer are killed after the parks close. Ottawa Hills crafts plan for bow hunt deer cull, 13abc.com, Jan 27, 2016The Village of Ottawa Hills is moving forward with a plan to bow hunt deer in the village. Voters approved an ordinance in November, giving the village the green light to perform a bow hunt to kill deer. Supporters of the plan say the village has too many deer and they are destroying vegetation. Ottawa Hills mulls proposed deer kill, Toledo Blade, Jan 27, 2016Ottawa Hills officials should have a draft proposal next month that outlines the policy for a deer kill to happen in the village this fall. In November, residents voted 58 percent to 42 percent in favor of the sometimes controversial plan. A similar proposal was defeated in 2010. Village officials said they expect most of the hunters will use elevated tree stands, from which they shoot downward at an average distance of 10 to 30 yards. Off-target shots generally result in the arrow sticking in the ground. Ottawa Hills officials also stressed that the hunting will not take place throughout the entire village. Instead, it will be a tightly controlled hunt confined to specific public spaces. In recent years many municipalities, including Solon, Granville, and Mentor in Ohio, have turned to deer-control measures across the country. In Ohio, the deer population has swelled from 30,000 to more than 700,000 in 40 years, ODNR representatives said. Ottawa Hills officials conducted an aerial count in 2010 and 2015, both times finding 76 deer. Deer kill continues through March 31, Toledo Blade, Jan 12, 2016Tim Schetter, the Metroparks’ natural resources director, and Scott Carpenter, the park district’s spokesman, presented a Nov. 6 management plan and permit application attributing many biological problems arising at Oak Openings and Wildwood to excessive deer. Those two parks “harbor the greatest concentration of rare species and biological communities in the park district and there is a growing body of evidence within these parks documenting significant negative ecological impacts associated with deer overabundance,” the report states. Deer sterilization: Compassion, sport, need, science collide, Washington Times, Jan 9, 2016Cincinnati began actively managing deer in some city parks in 2007. The first two years it used Cincinnati Police sharpshooters. For the last six years, bow hunting has been allowed on some park properties. Since 2007, the program has taken 1,066 deer. It has reduced the herd a bit. Using Google Earth and working with volunteers in the neighborhood, he learned as much as he could about the Clifton neighborhood herd. Flyovers showed between 30-50 deer, but that was considered to be a low count. The premise is sterilization only works because female deer tend to remain near a particular area. Especially if there are no natural disturbances, like this part of Clifton, one square mile. Also to be considered, Comer said, is that sterilized deer live longer and there are still questions about how their social and reproductive behaviors might change with fertility control. What’s clear is that neighborhoods, like Clifton, are apparently reaching their thresholds for the amount of damage and danger (mainly collisions with vehicles) caused by whitetail deer. Marksmen from APHIS Wildlife Services will work in conjunction with officials from the Ohio Department of Natural Resources’ Division of Wildlife, Mr. Madewell said, and be joined in the cull effort by Metroparks’ rangers and resource management staff. Cuyahoga Valley National Park to cull deer with sharpshooters, Cleveland.com, Dec 18,2015The Cuyahoga Valley National Park next year will join a growing list of public entities that have turned to lethal deer culling to control unnaturally large populations. The national park that straddles Cuyahoga and Summit counties wants to take 350 deer a year for the next four years. Sharpshooters from the U.S. Department of Agriculture will work from early January through mid-March. Cincinnati, Ohio Neighborhood Launches Deer Fertility Control Research Project, Humane Society US, Dec 11, 2015Under a research permit issued by the Ohio Department of Natural Resources, veterinarians and capture professionals managed by eco-system and wildlife population research consultant, White Buffalo Inc., spent the first week of December in Cincinnati anesthetizing, sterilizing and tagging female deer in and around the three parks. 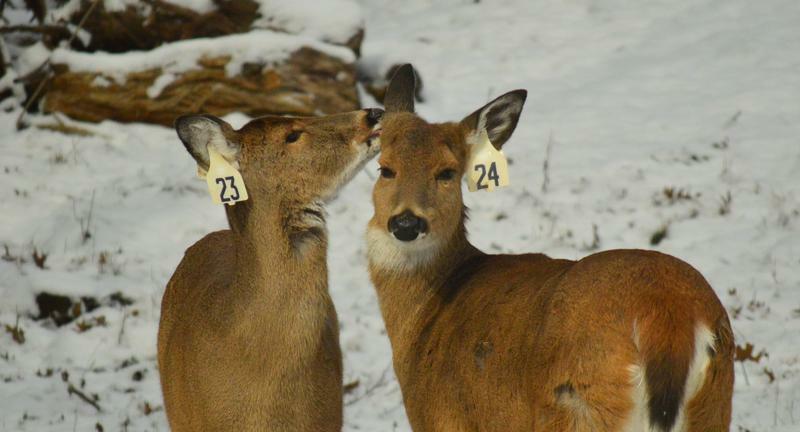 Based on preliminary field observations, DeNicola estimates that the 41 does sterilized during the first year of operations represent about 90 percent of the local adult doe population. This estimate may be revised based on a more definitive population survey presently underway. Granville archers work to control deer population, The Denisonian, Dec 9, 2015For the past three years, archers arrive every year during Christmas break to participate in the Granville Deer Management program to curb the troublesome deer population within Granville’s limits. Lyndhurst considers rarely-used method to deal with deer, Fox8, Dec 9,2015City officials have talked with the Ohio Department of Natural Resources and a private firm about the possibility of using cage-like traps to catch the deer and then euthanize them. ODNR says this method is sometimes used in densely-populated areas where gun or bow hunting would be hard to do safely. Lake County deer population taking hit, but still high, News Herald, Nov 28, 2015At the Holden Arboretum in Kirtland, for example, an enormous deer exclosure — an 8-foot-high, 16,750-foot-long fence — is largely proving effective in reducing the number of deer and deer damage in the Kirtland property’s 230-acre core. The fence, completed in late summer, includes man gates and steel grating at each end of Sperry Road. The grating normally discourages deer from crossing because it’s hard on their hooves. However, there is evidence that, on occasion, some deer have shown willingness to cross the grates, said Arboretum Conservation Biologist Mike Watson. “Also, when a gate is left open, deer will walk right in,” he said. Holden has allowed hunting in its natural areas for nearly 30 years to reduce the negative impacts of deer “browse” on forest health. County sees 25 percent increase in deer-related car accidents, WNEM.com, Nov 19, 2015The sheriff’s department has already handled 73 car deer crashes this month, up 25 percent from this time last year. He said these types of crashes pose a real danger to deer and driver alike. If you can imagine hitting an object that weighs up to 200 pounds it can depending on the type of vehicle it could come through the windshield or whatever,” Skrent said. Debate intensifies in area after buck kills family dog, Toledo Blade, Nov 18, 2015On Saturday, a 9-year-old Bouvier des Flanders dog was attacked and killed by a 10-point buck on Isha Laye Way in Toledo, near Ottawa Hills.The dog was let into the backyard at about 6:45 p.m. Owner noticed a doe and a buck in the yard. When the buck saw Quincy, it lowered its head and gored the 110-pound dog in the side. The dog took three steps before collapsing. The entire sequence took no more than 30 seconds. Both deer then jumped a chain-link fence and ambled into a neighbor’s yard and ate out of a bird feeder. Miami County sees increase in deer crashes, WDTN.com, Nov 16, 2015The Sheriff’s Office says if your vehicle strikes a deer do not touch the animal. The frightened animal could hurt you if it tries to move. The best thing to do is the get your car off the road if possible and call the police. Clifton deer population to be spayed. Yes, spayed., Cincinnati.com, Nov 12, 2015Here’s how it works: An expert from New England does the spaying. Deer are tranquilized, put in a mobile medical van, surgically sterilized, tagged, given antibiotics and pain medication and then released. The effort is expected to slowly shrink the herd. The procedure takes about a half hour. The sterilization will happen at night the first week of December. Forty deer are expected to be sterilized. Westlake City Council approves deer cull to curb accidents, Cleveland 19 News, Nov 9, 2015Westlake City Council voted last week to implement a deer cull, a selective reduction of wild animals, to control the city’s swelling deer population. Council members voted in favor of hiring sharpshooters, police and firefighters, as deer-vehicle accidents in the area increase. Ottawa Hills passes deer hunting law to control population, WTOL11News, Nov 4, 2015Ottawa Hills residents passed a deer culling law Tuesday, allowing bow hunters to take aim at the deer population. Voters in six cities to give opinion on deer culling, but council has final say, Cleveland.com, Nov 1, 2015The Ohio Department of Natural Resources must evaluate each area to determine if deer are a nuisance, before deciding whether to issue a permit to allow for bow-hunting. Each city would then evaluate the safety and practicality of bow-hunting in the area, and its police chief or safety director would issue city permits. Deer culling can begin as early as Nov. 1 in Solon, Cleveland.com, Oct 29, 2015The city expects to spend $85,000 this year to control its deer population this year. City Council’s Safety and Public Property’s Committee has approved an agreement with the United States Department of Agriculture (USDA) to supply sharp shooters to cull deer on public and private land. This is the fourth year the city has worked with the federal agency to control its deer population. The contract will be paid incrementally, based on time and materials used. 7 Cuyahoga County cities unite to ask voters to curb deer population, Cleveland.com, Oct 18, 2015The seven southwestern cities started working together in July to develop strategies to control deer population growth, after the Ohio Department of Natural Resources declined to take responsibility of managing deer. The agency instead said it would provide guidance and support instead. Editorial: No to deer cull, Toledo Blade, Oct 8, 2015Ottawa Hills is home to about 80 white-tailed deer, which some residents complain pose a nuisance to their manicured gardens and roadways. They want to address that problem by repealing a village ordinance that prohibits hunting and fishing on public land and allowing the village to adopt a bow-hunting program to control the deer population. Deer sterilization effort in Cincy parks gets boost, Cincinnati.com, Sept 28, 2015A local group has received a $20,000 grant to expand white tail deer sterilization program in city parks. The grant from the Humane Society of the United States will allow CliftonDeer.org to pursue its nonlethal deer population control program in Mount Storm Park, Rawson Woods and Edgewood Grove parks. Wildlife find our surroundings quite comfortable, The Blade, Aug 11, 2015White-tailed deer and Canada geese are both prolific, and notorious, and they excel at living in close proximity to humans. That’s where the trouble starts. “They are very adaptable, and very good at recognizing good habitat so they are coming into our backyards,” said Marne Titchenell of the Ohio State University Extension Service, which hosted the session titled “The Good, The Bad, and The Hungry: Dealing with Wildlife Conflict in the Landscape”. “But in areas where we are allowed to hunt, hunting is the best management option,” she said, adding that the focus should be on harvesting does. Metroparks of the Toledo Area is planning a third year of controlled archery hunts to reduce deer numbers, and the damage whitetails have done in the Oak Openings area. Metroparks archery hunt aimed at managing deer herd, Toledo Blade, Aug 4, 2015Metroparks of the Toledo Area has opened the application process for archery permits to harvest white-tailed deer on certain properties in the district, as part of a comprehensive wildlife management effort. The program, now in its third year, continues to evolve as part of an effort to control a burgeoning deer population, which has grown to “unnaturally high” levels and, as a result of these increased deer numbers, sensitive natural areas in the park are threatened with over-browsing and the loss of habitat for ground-nesting birds. There is also the threat of increased health problems for the deer when they concentrate in increased numbers. Nonlethal program to target burgeoning Clifton deer population, WCPO Cincinnati, July 18, 2015In November, White Buffalo Inc. will spearhead a weeklong effort to sterilize at least 40 female deer in Clifton’s Mount Storm Park, Rawson Woods Bird Preserve and Edgewood Grove. White Buffalo’s president predicts the effort will reduce the population of white-tailed deer in Clifton by about 40 percent within two years. Deer hunt in Ottawa Hills goes to ballot, Toledo Blade, July 23, 2015The initiative petition, a citizen-driven measure that required signatures to get on the Nov. 3 ballot, would include repealing the 1940 ordinance that prohibits hunting and fishing on public land in the village, and calls to change language to allow bow hunters to kill white-tailed deer after getting authorization from the village. Petition to put Ottawa Hills deer cull on November’s ballot moves forward, Toledo News, July 18, 2015About 10 days ago, three people from the Village of Ottawa Hills put together a petition to put the deer cull on the November ballot. They needed up to 173 signatures or 10 percent of the voting population from the last gubernatorial election. On Monday, they turned in more than 400 signatures in support of putting an organized bow hunt on the ballot. Ohio reaction to case of chronic wasting disease in Michigan deer, ABC News, June 8, 2015Chronic wasting disease is caused by the transmission of infectious proteins in saliva and other bodily fluids of infected animals. It is not clear at this point how the deer in Michigan contracted the disease. The doe was found wandering around a residential neighborhood near Lansing. Two injured in motorcycle-deer crash shutting down U.S. 30, Mansfield News Journal, June 6, 2015“The motorcycle was going westbound on U.S. 30 near the Springmill exit. In between at some point it struck a deer,” Kilgore said from the scene. “The bike skidded to a halt past the Springmill exit and both the driver and the passenger skidded to a stop near the Springmill exit. Ottawa Hills reviews plan to cull deer herd, Toledo Blade, June 2, 2015Ottawa Hills voters might decide whether the village will thin its deer herd with a bowhunting program suggested by a task force that studied the issue. The village council Monday night reviewed a plan presented by its Ottawa Hills Wildlife Management Task Force, complete with recommendations for managing the deer population in the village. While the plan outlines several nonlethal methods for dealing with deer in the village, the task force recommends Ottawa Hills adopt a controlled, bowhunting program within the village to manage the population. Paulding Co. man dies in motorcycle accident, Toledo Blade, May 30, 2015Mr. Bidlack was riding west on Wetzel Road, approaching Hoaglin Center Road in Hoaglin Township about 3:40 a.m. Friday when his motorcycle struck the deer, throwing him to the ground, according to the patrol. Costs of Avon Lake deer cull less than expectedThe Chronical, May 7, 2015AVON LAKE — The cost of the city’s deer culling operations with sharpshooters was substantially lower than initial quotes provided by the United States Department of Agriculture. The city signed an initial service agreement with the USDA to spend up to $15,960 for sharpshooting services, but the actual cost came in at $8,557 for the 19 deer that were killed between Feb. 27 and April 11. Stratford-area man dies after deer hits windshield, Wausawdailyherald.com, April 18, 2015One vehicle hit a deer, which was thrown into the windshield of a second vehicle driven by Rogan, according to the department. Other people in the vehicle, including Rogan’s wife and seven children, had minor injuries. Rogan was seriously injured in the crash and later died at the hospital from crash-related injuries, according to the department. East-side Cleveland suburban deer study finds as many as 37 deer per square mile, Cleveland.com, March 26, 2015Cities on the outskirts of the county, including Avon Lake and Solon, use sharpshooters to thin the deer population, while Cleveland Metroparks culls deer annually. Chaikin said Shaker Heights hasn’t had any conversations about sharpshooting, but Geoff Westerfield, Assistant Wildlife Management Supervisor at the Ohio Division of Wildlife, said the communities shouldn’t rule the option out. “You could use sharp shooters in any one of those communities, it’s just finding the right spot to use them; it’s not the solve-all solution,” Westerfield said. Blacklegged ticks, Lyme disease risk feared on the rise in Ohio this year, Cleveland.com, March 24, 2015In a memo sent March 20 to health departments across the state, ODH Medical Director and state epidemiologist Mary DiOrio wrote that the presence of the blacklegged tick, the main carrier of Lyme disease, has spread throughout the state. Health care providers should check for the telltale symptom of an expanding rash. Left untreated, people who contract Lyme disease can also develop fatigue, chills, fever, headache, muscle and joint aches, swollen lymph nodes and Bell’s palsy. Urban, suburban areas overrun by deer grasp for fix, OurTown Perrysburg, March 22, 2015Amid the rugged terrain of Michigan’s Upper Peninsula and in the wilderness areas of the American West, Mother Nature still might display a balancing act perfected over millennia. Predators at the top of the food chain help keep the populations of deer in check, reducing — if not eliminating — overbrowsing and malnutrition. In some urban and suburban settings, where the apex predators of another era have long since been removed and the current landscaping practices present a near perfect environment, deer numbers have exploded. Communities around Toledo — such as Ottawa Hills and Maumee — and those near Cleveland, Columbus, and Cincinnati, as well as those in Michigan and around Pittsburgh and many other metropolitan areas, have a serious issue with intensifying deer-human conflicts. Initial deer cull at eight in Avon Lake, Chronicle, March 14, 2015The sharpshooters, who work for the U.S. Department of Agriculture, can kill deer in Avon Lake until April 15. The city entered into a $15,960 contract with the department for the service, which includes travel, supply and vehicle costs. The department is also in charge of eviscerating, cleaning and storing deer following operations and transporting the deer to the venison processor within 24 hours of removal. Deer culling begins at Weiss Field in Avon Lake, Chronicle, March 13, 2014Two sharpshooters, who the city paid the U.S. Department of Agriculture $15,960 for, didn’t enter the park through regular entrances off Webber Road and they were never seen by anyone in the park. Geoff Westerfield, Ohio Division of Wildlife assistant wildlife management supervisor, said the men would use regular hunting rifles with noise suppressors to shoot and kill deer from elevated positions. Avon Lake deer culling to start soon, Chronicle, March 10, 2015City Council approved an ordinance Monday allowing sharpshooters hired through state or federal agencies to conduct culling operations on city property. Council also approved a service agreement with the United States Department of Agriculture that authorizes spending up to $15,960 on sharpshooting for culling operations.Councilman John Shondel, who spearheaded the ordinance, said sharpshooting on city property is just one piece of a larger deer management program. “I’m so thankful we got approval to take this second step to do things on city property,” he said. Sharpshooting, deer cull plan at Ohio national park approved, Dayton Daily News, Feb 26, 2015Park officials had studied the population issue for eight years, and argued the cull is necessary to protect trees and other vegetation within the park. Under the plan, sharpshooters would shoot the deer at night from stands in areas of the park off-limits to the public. The venison would go to local food banks. Cuyahoga Valley National Park’s Deer Culling Plan Approved, IdeaStream, Feb 26, 2015Later this year, sharpshooters will be entering sectioned off areas of Ohio’s only national park. It’s part of a 15-year, $4 million, deer-culling plan for the Cuyahoga Valley National Park. It was approved yesterday by regional administrators. As ideastream’s Brian Bull reports, the plan is aims to bring natural balance back to the park. Right now there’s about 50 deer per square mile. Petit says sharpshooters will hopefully get the herd size down to roughly half that. “We believe in four years, we can bring the population well within that density range, to about 23 deer per square mile, which is a great healthy density to have,” she says. After the sharpshooting phase, the next step will have remaining female deer treated with an injectable contraceptive, still in development. Lorain County communities take another look at ways to control deer population, Morning Journal, Feb 12,2015Avon Lake will consider allowing sharpshooters to help thin the herd of whitetail deer roaming the city. July 2014, Avon Lake Mayor Greg Zilka signed legislation allowing citywide, year-round application for deer damage control permits for property owners who wanted to eliminate deer from their yards. However, since he signed the legislation in July 2014, only two people in the city of almost 23,000 people have requested the permits, Zilka said. They took a total of three deer, said Zilka and Councilman John Shondel, who sponsored last year’s legislation. Sharpshooters could expand deer cull ordinance in Avon Lake, ChronicalOnline.com, Jan 28, 2015Deer populations continue to grow and so does the city’s deer management program, which soon could include the option of hiring sharpshooters to cull deer on city-owned property. Cleveland Metroparks resuming deer culling in 10 reservations, Cleveland.com, Jan 12, 2015Park officials say the objective is to balance the ecosystem which includes protecting plant life from a deer population that is too large to sustain itself on the park system’s 23,000 acres. The sharpshooting-based program begins next week and is expected to end by mid-March. It has undergone little change since it began in 1998, according to park officials. Cuyahoga Valley National Park recently released its final White-tailed Deer Management Plan and Environmental Impact Statement. It includes a combination of lethal and nonlethal actions, including sharpshooting and limited capture/euthanasia initially to quickly reduce deer herd numbers. The deer population in Ohio’s national park is too dense, officials say. Cuyahoga Valley National Park staff are awaiting the implementation of a 15-year plan that they say will reduce the deer herds and help restore park habitat. Bow hunters called upon to cull urban deer herds, Columbus Dispatch, Dec 7, 2014State wildlife officials say more cities and park districts are asking for guidance on reducing deer populations. Sharpshooters to cull deer in Cuyahoga Valley National Park, CantonRep.com, Dec 5, 2014The National Park Service has unveiled a plan to use sharpshooters to reduce the deer population in the Cuyahoga Valley National Park. Ohio national park plan calls for 4-year deer cull , Wooster, OH, Daily Record, Dec 5, 2014Summit Metro Parks and Cleveland Metroparks have used sharpshooters to kill deer for years. Ohio wildlife representative says state won’t kill deer for Cuyahoga communities, Cleveland.com, Nov 18, 2014Bay approved a ban on intentionally feeding deer about three years ago, but the city does not allow lethal measures. Westerfield said lethal control — essentially bow hunting — could be done in Bay Village, but he always urges communities to begin with a non-lethal approach. Westerfield worked with neighboring Avon Lake to develop its deer management policies, which — along with less drastic measures — now include an option for controlled bow hunting with the proper permits. Cease Fire: Citizen committee pushes for humane population control of white-tailed deer, CityBeat, Nov 12, 2014There has been one recent approved population control study done in Ohio. From 2001 to 2006, Cleveland Metroparks conducted a $500,000 study on immunocontraception — administering a certain drug that uses the animal’s immune system to prevent fertilization — finding that it did decrease deer pregnancies, but Metroparks suspended the program after the mobility of the animals made the drug difficult to administer. Hunting course available for deer culling in Avon Lake, Morning Journal, Oct 8, 2014City Council passed the ordinance July for bow hunting inside city limits with the proper permit. This ordinance will allow hunting of deer year-round. First deer with Chronic Wasting Disease diagnosed in Ohio, Columbus Dispatch, Oct 2, 201Ohio is the 14th state to have discovered Chronic Wasting Disease in its captive deer population. Nineteen states, including Pennsylvania, have found the disease in their wild herds, said a spokeswoman for the Ohio Department of Natural Resources. Nevertheless, the state has launched an effort to monitor wild deer in a 6-mile radius of Millersburg through sampling the lymph nodes of dead animals, including any deer killed by vehicles. Ohio is the 14th state to have discovered Chronic Wasting Disease in its captive deer population, Vance said. Nineteen states, including Pennsylvania, have found the disease in their wild herds — a much more serious situation because it is difficult to contain. Solon’s deer population decreasing with sharp shooting: Q&A, Cleveland.com, Sept 18, 2014Each community has to take care of it on their own. Eventually, we will have to look at deer as a regional problem. It becomes burdensome on smaller communities. I think we will see more regionalization in a few years. Deer hunting is safe, cost-effective measure for parks, Cincinnati.com, Sept 11, 2014Right now deer hunting is the only safe and effective method to deal with the overpopulation of the deer in our parks in and around the city of Cincinnati. “We are demanding that the state meet its obligations, do its duty and require the (Ohio Department of Natural Resources) in urban areas to take proactive steps to reduce and control the deer population,” Stefanik wrote in a draft letter from the association to Ohio elected officeholders. East-side suburbs form coalition to deal with deer; how you can prevent them from dominating your yard, Cleveland.com, July 22, 2014There were no deer in Ohio at the turn of the century, and the population has grown rapidly since the 1990’s, according to Cleveland Metroparks Director of Natural Resources Terry Robison. Metroparks began culling deer in 1998 to manage the population. Landscaping makes for easily accessible food, and plant destruction is one of the most common complaints Greg Miller receives. The effortless meals contribute to higher birth rates. Avon Lake defines deer-culling program, Chronical Online, July 28, 2015Avon Lake Mayor Greg Zilka said the difference between hunting and culling is subtle, but it is a difference nonetheless. “This is not hunting,” Zilka said of the new legislation. “It is the taking of deer with an agricultural damage permit under limited circumstances.” Zilka said the city will have the ultimate authority over the nature of a culling operation. Avon Lake defines deer-culling program, Chronicle-Telegraph online, July 18, 2014The city has more control and leeway to tackle the problem. He said the removal of acreage and setback requirements, which existed in the previous ordinance, allows for greater effect. “I do think the Cleveland Metroparks’ deer-culling program is the most comprehensive and effective in Cuyahoga County,” said Dr. James K. Bissell, the Cleveland Museum of Natural History’s director of conservation. City hopes to rein in deer problem, The AthensNews, Nov 17, 2013“There have been people who’ve hit deer but if you’re going 25 miles per hour, it’s not usually a big accident,” he said. “A bigger problem is the predation of ornamentals (yard vegetation) in the city.” Third Ward council member Michele Papai also noted health risks associated with a larger deer population in city limits, such as those arising from excrement and the like. Wiehl noted that this can lead to encephalitis, Lyme disease and tick-borne illness. “Although absent from the state for nearly two decades, the white-tailed deer, Ohio’s only big-game animal, now occurs in all 88 counties,” the site said, further stating that southeast Ohio specifically creates an excellent hunting opportunity. Untracked ticks, Lyme disease big risk in Ohio, Columbus Dispatch, Sept 1, 2013Josh Neptune, who lives on 30 partially wooded acres in Coshocton County, suffered for months with severe symptoms of Lyme disease before he finally met an infectious-disease expert who diagnosed it. His family doctor initially told him Lyme disease was impossible in Ohio, Neptune said. Cuyahoga Valley park seeks to kill 375 white-tailed deer per year, start deer contraception , Ohio.com, July 30, 2013The Cuyahoga Valley National Park wants to use sharpshooters to kill up to 375 deer a year for four years, said Lisa Petit, chief of resource management for Cuyahoga Valley. After that, 175 deer would need to be shot annually in an effort to allow the deer-ravaged forest to regenerate, Petit said. Park officials would like to implement the plan in the winter of 2014-2015, at the earliest, Petit said. After five years of thinning the herd, the 33,000-acre federal park would kick off a deer contraception program to treat nearly 400 does to keep the deer numbers from growing, she said. The does would require treatment every two years, she said. Right now, there are no contraception methods that meet all federal guidelines for park use so this part of the plan is uncertain, Petit said. City Of Mentor Receives Permission To Begin Deer Culling, Mentor Patch, Jan 8, 2013The program has five parts: educate the public on the dangers of deer overpopulation; get an accurate count of of the deer population in Mentor and its distribution; start a traffic-safety program that focuses on avoiding crashes with deer; legalize regulated hunting; and use sharpshooters from Mentor Police Department to cull deer herds. Ohio’s Urban Deer Units — Are They Working?, Game and Fish Magazine, Oct5, 2010In 1994, Urban Deer zones were created, centered around major urban areas.” Deer populations in Ohio’s urban-suburban areas, along with the rest of the state have been increasing dramatically. As the numbers rose, so did complaints of deer damage and as deer-vehicle collisions.